I had big plans for a massive surge of productivity in this, the last week before Ron gets home from tour. I was going to start on my shiny new work routine. I even made a spiffy banner to reinforce it (no, that wasn’t pure procrastination; okay, yes, it was). I was going to finish all my half-finished projects so I could look like a TCB badass. But the water had other plans for me. I finally cleaned and sorted a bunch of boxes of junk from the boiler room! Now I have buckets of plumbing supplies and buckets of electrical supplies, and the mouldering boxes and all the useless crap collecting dust and spiders is mostly gone! Ditto the galley storage area. I’ve ditched a good 6 trash bags altogether, plus a couple bags for Goodwill and a fair amount of recycling. Take that, water! Try to disrupt my 40 Bags progress, will you? Ha! I finally made a short leader hose for the submersible pump. While I was at it, I hooked up a hose extender with a splitter with big, easy-to-turn levers for each tap. One goes to the courtyard and one goes out to the barn. The weather, when it’s not storming, has been delightful! 70s and sunshine and puffy clouds, in June! No AC yet, barely any fans. I don’t usually turn on the AC this early, but I usually want to. And when it is storming, it’s dramatic! Hours of breathtaking lightning last night, two trees knocked out over the weekend (neither of which I’m crying over–well, except the cleaning them up part). 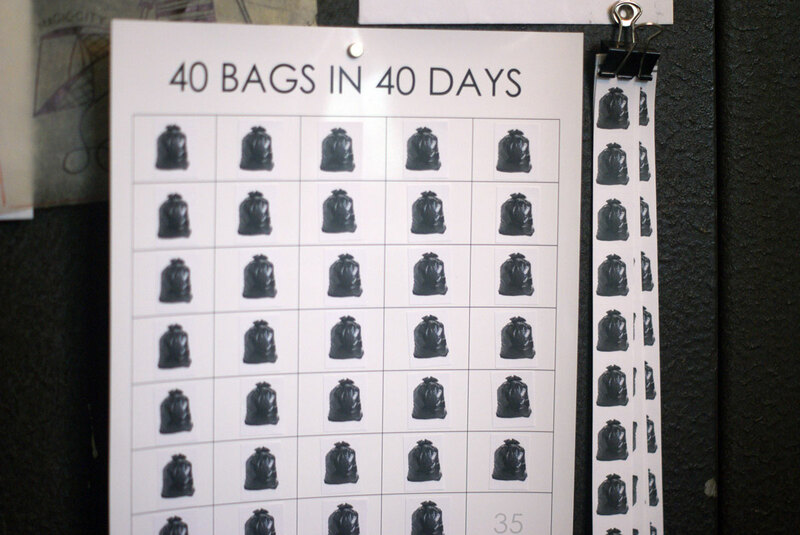 If you’re curious about the 40 Bags in 40 Days thing, go here. 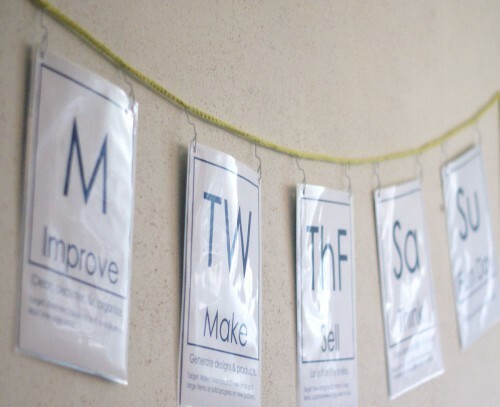 It was for Lent, so the official challenge is probably over, but I’m working on my own timetable. And if you want to be a big nerd like me and make yourself a sticker chart, I’ve set up a template to print stickers on those ubiquitous return address labels, using the garbage bag graphic and the idea from White House Black Shutters. If you prefer a plain chart, she has one you can download; I like ticking off the numbers. This pdf includes a numbered sticker chart and a sheet of labels, and a link to the WHBS post about it: 40 bags stickers and charts. 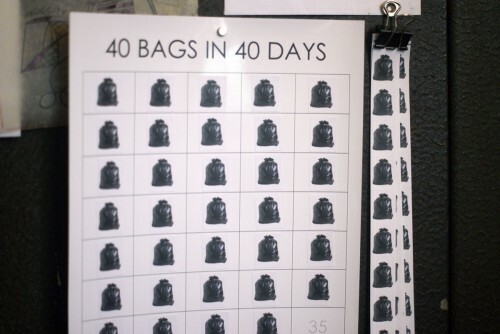 Thanks for pointing me to the 40 Bags challenge. AND for the deliciously nerdy stickers! I’m pretty sure I have more than 40 bags worth of crap to get out of my house but thinking of it that way has ensured that I haven’t anything. Hopefully this will help me reduce the mountain to bite-sized bits. Previous PostPrevious Another windbag going on and on about nothing. 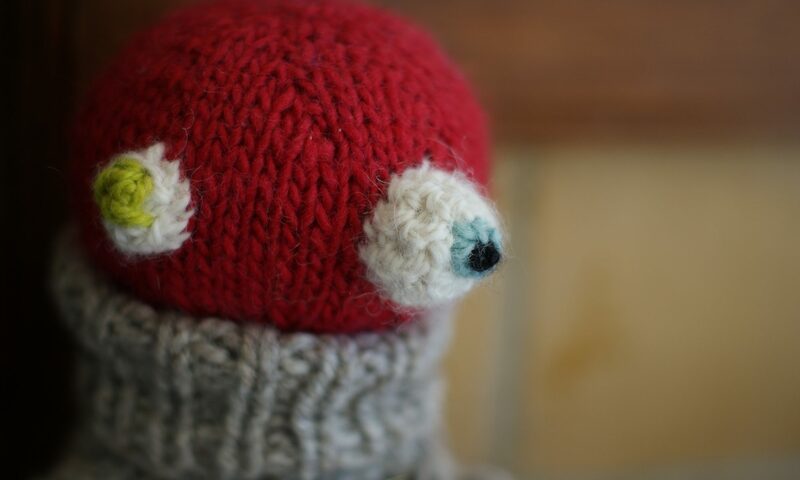 Next PostNext Gringo Hats: Done and Done!